Moyne and Liffey in the headline are the rivers with those names, respectively flowing through a town that was once called Dublin, but had its name changed to Port Fairy by an act of the Australian Parliament, and the other through Dublin in Ireland. The architectural comparison between the two places began when we visited Bruce Henderson's Australian web site at Warrnambool.com (content may have changed by the time you visit) and read in the caption for the picture on the left , 'Dublin House built in 1855 is a good example of the local architecture of the time…'. Visit for an interesting historical explanation of the how and why of the place names. The second picture has a caption that held our attention: 'Construction of the Caledonian Hotel commenced in 1844 with the upstairs accommodation added in the early 1850's, however the work was interrupted as workmen downed tools to join the rush to the Ballarat goldfields - the upstairs section of the pub remains incomplete to this day. The Caledonian also holds the distinction of being Victoria's oldest continuously licenced hotel.' Everywhere we turn there is somewhere with an interesting history to be told to those who take the time to listen. Check out Bruce's home page for more details, pictures of other buildings, and pictures of the boat moorings along the river. The Port Fairy web site has its own history page, and Dublin House is represented on the web. Although hundreds of web sites touted rooms at the Caledonian as a Best Western® hotel (THE WORLD'S LARGEST HOTEL CHAIN®), the hotel was curiously absent from the company's own web site. Perhaps the web site, like the upper storey, is unfinished. Searching for architectural photographs of the original Dublin, we found Images of Dublin. This delightful tour of the city had us swithering over the most representative architecture, but finally we chose the O'Connell Bridge on the left, and the Customs House on the right. In a city with a wealth of Georgian architecture, it was not an easy choice. Visit the web site for many more pictures, all neatly categorized into galleries to give a virtual tour of the Irish capital. Don't just take our word on the quality of this site: it won a Golden Spider award in 2002 for Best Personal Website in Ireland's longest running internet competition, which is sponsored by Esat BT, the national telecommunications service. I confess at the start that I am not a lover of the grandiose, not even for temples or cathedrals. The picture on the left is the LDS Temple in St. George, UT. 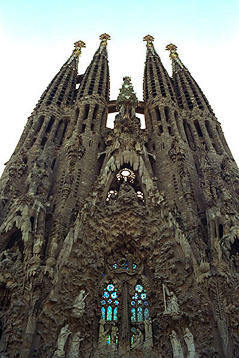 That on the right is the east facade of La Sagrada Familia, Barcelona, Spain. I have seen a big enough sampling of famous religious buildings to say that for me the intended effect just does not happen. I always have a niggling suspicion that the architects are celebrating the worldly achievements of their patrons rather than the divinities in whose name the buildings are erected. I apologize unreservedly if that causes offence to anyone in southern Utah, where people have been openly welcoming to this heathen from a far off shore. The nearby Tabernacle does get full marks! That's not to say that within their own terms of reference many of the buildings do not work at some level. At night the LDS Temple burns like a beacon in the center of the surrounding town. The medieval cathedrals of Rouen, Orvietto, Mont St. Michel, Durham, Salisbury, Lincoln, and Wells are each splendid in their own way. Even the stumpy, much knocked about, truncated cathedral of my home town of Carlisle is not without its own endearing features. I have never seen Antonin Gaudi's Barcelona Cathedral, but I think that may just work for me because of the playful, capricious nature of its surrealist references. The picture was taken by Angus McIntyre whose site is well worth a visit. Click on the handy site map and there are six galleries for areas all round the world. The specialist sections for Petra, and the Inca Trail are absorbing… but there's much more; poetry, writing, and collecting to name just some. Everything is nicely ordered on the site, which is as neat and well implemented as anything you will find on the net. Dig deep enough and you will even find a recipe for Greek style spinach pies!